Ankle sprain is the most common athletic injury. Typically results from inversion stress with the ankle in plantar flexion. Natural history: chronic lateral ankle instability leads to progressive osteoarthritis of the ankle. Lateral ankle ligament failure is typically by midsubstance tearing. ATFL is most commonly injured, followed by the CFL. Evaluate heel aligment. Patients with hindfoot varus are at increased risk of recurrent instability / failure with operative and nonoperative treatment (Kuhn MA, Foot Ankle Int 2006;27:77). Anterior drawer test: the ankle is allowed to plantar-flex slightly, and an anterolateral rotatory force is applied to the heel. The talus will rotate anterolaterally as it slides forward due to the intact deltoid ligament; it will not displace forward if it is not allowed to rotate. Performed with the patient in the sitting position and the knee in flexion. Document neurologic exam: recurrent inversion sprains may cause injury to branches of the superficial peroneal nerve with altered sensation or sensitivity in the anterolateral foot. Recurrent instability characterized by: history of multiple ankle sprains, functional instability, pain, and difficulty walking on uneven ground. Consider stress xrays for chronic instability. Talar tilt angle 5 degrees greater than that of the normal side or an absolute value of 10 degrees = pathologic laxity. 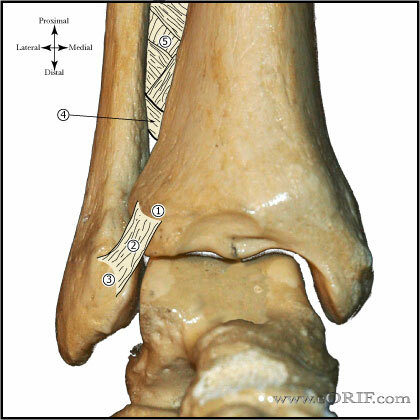 Talar tilt angle is the angle between the talar and tibial articular surfaces measured on the mortise view. Lateral stress views with forward translation of 3 mm more than the contralateral limb, or an absolute value of 10 mm indicates mechanical instability. Grade I: Sprain of ATFL = mild swelling and tenderness, no instability. Grade II: ATFL tear, CFL strain = moderate swelling and tenderness, moderate laxity with anterior drawer, normal talar tilt. Grade III: ATFL and CFL complete rupture = severe swelling and tenderness, instability with anterior drawer and talar tilt. Treatment= rest, ice, compression, and elevation (RICE) with early controlled motion in a functional Ankle Brace or cam walker. Physical therapy to improve proprioception and strengthening of the peroneal muscles. Functional bracing for strenuous/high risk activity. A short period (10days) of immobilization in a below-knee cast or Aircast results in faster recovery than tubular compression bandage (Lamb SE, Lancet 2009;373:575). Surgical treatment = generally only for failed non-operative care = Modified Brostrom-Gould procedure. Bony avulsion: consider surgical repair. Return to sport is permitted when painless cutting, running, and the ability to jump on the affected leg 10 times without pain is experienced. Protective bracing / taping is indicated for patients with grade II and III injuries for 6 months.